How many of us as Instructors really think about what and why we are teaching our students? Whether that is session to session or the overall program. I know many Karate Instructors who expect students to do as they are told because they are told but not told why or what the benefits are of what they are doing. I once had a very knowledgeable and senior Instructor tell me that I gave my students too much information about how and why they should be practicing a practical technique or drill. He said “you should just make them get on with it the same as we had to. They should be worked to failure” there is something to be said about that type of training both negative and positive. However I prefer to see quality in training rather than a cardiovascular exercise. I see myself as a Karate teacher not a fitness Instructor. Having said that it is also necessary to help a student to develop a strong spirit and attitude. You have to get the balance right not only for the class but for the individual as well. That is very difficult and takes a lot of consideration and working out. This is why a lot of instructors take a blanket approach or revert to easy options. You see so many classes now a days with lines of students being told to hit the pad with a kick or punch and being given praise whether it was a good or bad technique. I really hate that meaningless Americanism “Good Job” there is no meaning, basis or structure to this type of action. I won’t qualify it by calling it training. I have seen and been in sessions where you go over Kata time and time again without being corrected thereby building in the same mistakes and bad habits. It is OK to make money teaching Karate or any other Martial Art but not at the sake of your students but because of your students. You owe it to them to give them the relevant information and understanding of Karate. Their development should be paramount. Both I and my wife Elaine Johnston have been around the country visiting and also to training in some of the Dojo’s primarily for our own development and knowledge. We have trained with some great and inspiring teachers but we have also witnessed some very appalling practices. In the future I will give some examples of bad Instruction. Don’t you think Karate may have turned full circle? What I mean by that is when Martial Arts first came into being it was initially solo training, later, one Instructor and student or just practitioners getting together exchanging ideas or sparring. Later Instructors would hold classes with just a few students. 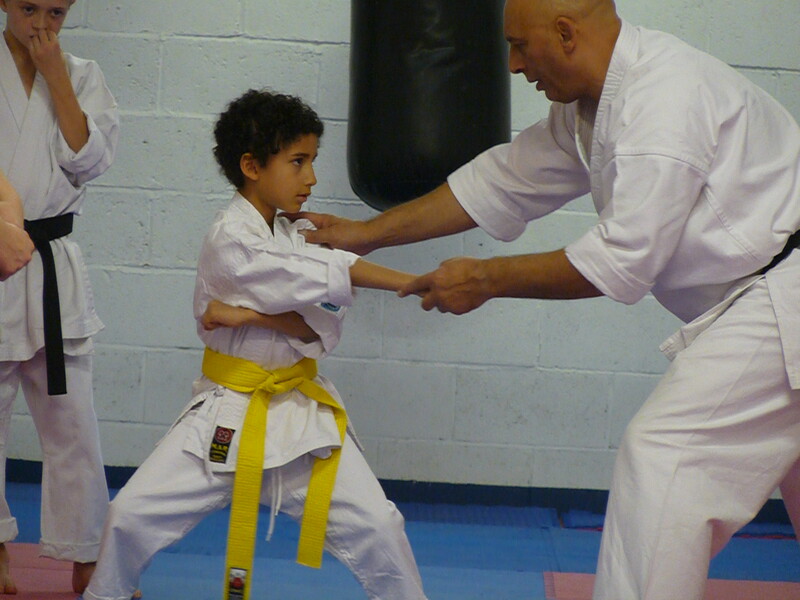 These classes would be very intense and robust, concentrating on Kata, Kata Bunkai, Self Defence and conditioning. These students were very dedicated and would be very grounded to their art gaining a deep and meaningful understanding of Karate. Later with the expansion of Karate to Japan and then to the world, we find that the principles, ethos and ethics changed dramatically with sport and commercialization take precedence. Large classes became the norm with techniques being watered down, more spectacular and less effective. Training was taught to cater to people’s vanity and egos. People weren’t pushed or taken out of their comfort zones and grades were easier to obtain. I now have the feeling that things are changing. I’m not talking about those clubs that are built on an American business model (Mc Dojo’s) or associations that are either sport orientated or have lower standards catering to the mass market. I look at the people who have looked at history and are going back to their Karate roots for knowledge and inspiration. They are bringing a modern approach to the old methods and making karate live again. You often find that these are smaller classes with the higher intensity of training and better quality of tuition. In answer to my friend and students question, I am far happier to have a small class of students who work hard together, are willing to learn more and understand Karate, than have a large class of those people who wish to go through the motions. So don’t demote small class sizes, celebrate and embrace them.